Looking back, it’s ironic to think that Ferrari would get themselves into a legal skirmish with SEGA over the use of a Testarossa in their iconic arcade racer Outrun (as well as its slightly less iconic Mega Drive port), yet were willing to attach themselves to one of the drabbest F1 racers there's likely ever been. 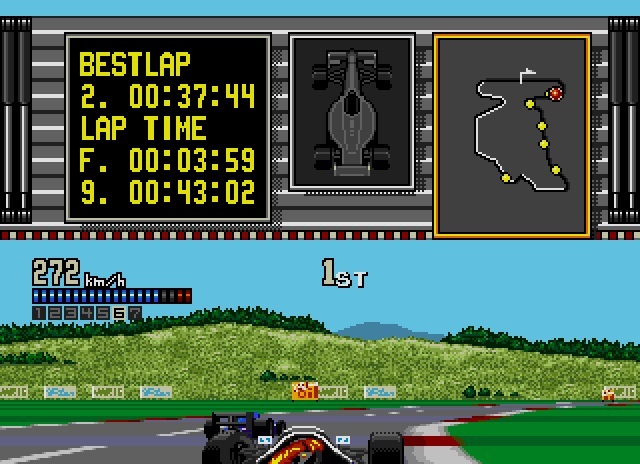 In one of their more ill-advised ventures, Flying Edge snapped up the rights to Aisystem Tokyo’s Japanese racer F-1 Hero MD, captured some seemingly last-minute Ferrari branding, and promptly got left on the startline by a myriad of slicker, more polished racing games. FGPC has a decent infrastructure, and easily enough options to have supported a simulation of considerable depth. Indeed, longevity (or prospective longevity at the very least) is where the game is at its strongest. 10 lap races, some nifty pitstops and tangible setup-change options all gear it towards being a heavyweight racer with an appropriately sharp difficulty. This most definitely isn’t one you’ll master in an evening, and its credentials are further enhanced by the need to triumph across four classes (ranked A through D) over four seasons in order to become World Champion. And by the third class, it’s already offering a tougher challenge than the comparatively tame campaign featured in Super Monaco GP. 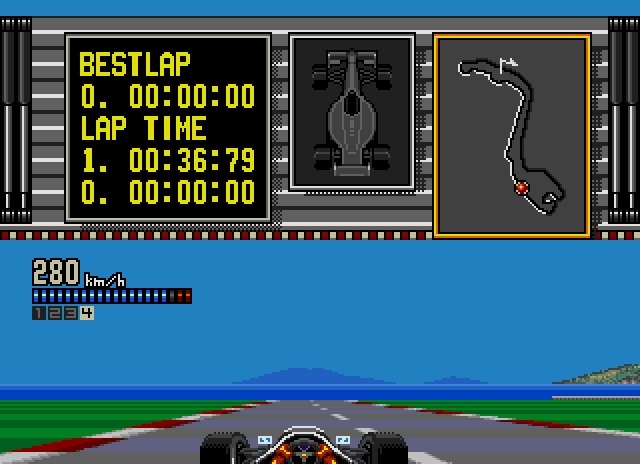 The difference is, Super Monaco GP plays really well. And Ferrari Grand Prix Challenge, with the best will in the world, does not. Problems stem from extremely basic graphics and a highly unconvincing game engine, and the troubles they end up causing each other. The road appears harsh and jerky, with the scrolling effect proving an absolute eye-sore. Draw distance is poor, whilst the sensation of speed is hindered by jarring, pop-in/pop-out scenery that jolts past. Elsewhere, matters aren’t helped by the lumbering rotation of some piteously low-rent backdrops and the highly unsettling way the A.I. cars bounce and bobble around in front of you. In short, it’s ugly. 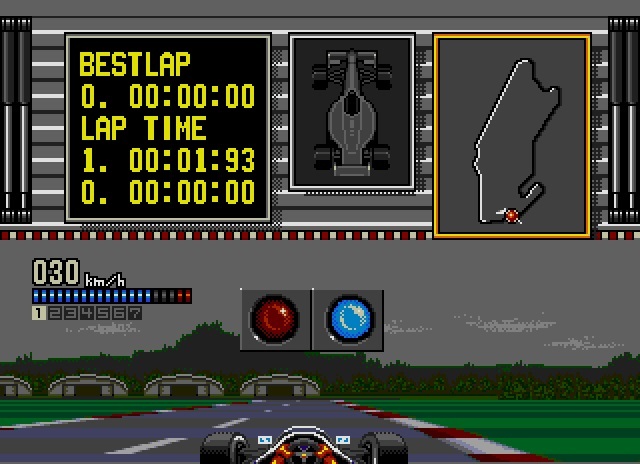 Half the screen is occupied by a depressingly drab though nevertheless informative pit-wall style HUD, whilst the presentation of the package is hindered further by some highly pixelated real-life stills that spoil the menus. Though on the audio side the game offers a couple of serviceable (though rather tinny) tunes, crash effects are nasty and the dull engine notes sound more like lawnmowers, and do nothing to capture the buzz of the sport. The gameplay is primarily undermined by the relationship between car and circuit, as all-told, it's not a happy one. There are times when it becomes a challenge simply gauging at what point a chicane is going to throw you out wide, as steering a fraction early is just as likely to cause a crash as reacting late. Hit roadside boards, and you’ll come to an instant standstill, leaving you to appreciate the strangely ponderous acceleration and weird conveyor-belt effect that often sees the circuit feeling like its rotating around your car, even without steering input. Tracks are limp and disappointing, and perhaps due to the sparseness of scenery (Monaco’s tunnel is no-show) they lack variety and don’t remotely capture the essence of their real-life counterparts. There are only seven A.I. competitors too, which is pretty meagre next to Ayrton Senna’s Super Monaco GP II, which manages fifteen, and at a considerably smoother rate too. 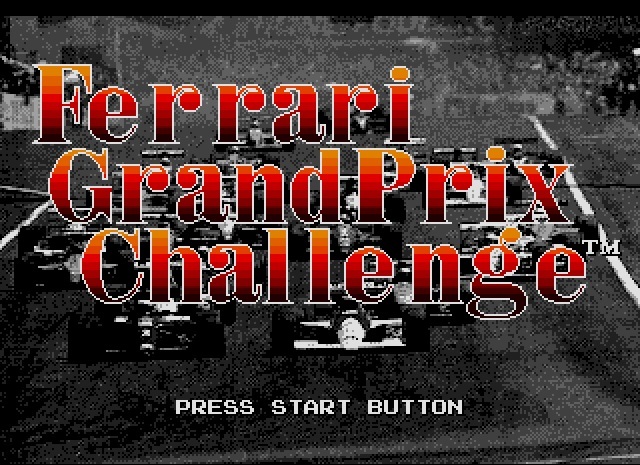 Whilst SEGA had already mastered a cool rear-view mirror effect, Ferrari Grand Prix Challenge uses a rather crude system of using car icons that move along a bar, morphing from yellow to red depending on how close your competitors get. In its defence, the British track is highly realistic. Look at the greyness! There’s no question, the use of the licence is especially disappointing, as the acknowledgement is so minimal. The Ferrari car is named properly and looks roughly like its real-life counterpart, but that’s seemingly where the affiliation ends. There’s no other evidence of the famed car-maker within the game, which seems as happy to show grainy stills of McLaren and Williams drivers as shots of the Prancing Horse. 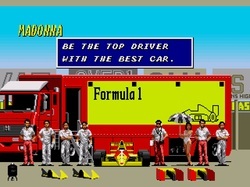 Though some of the avatars make clear allusions to real drivers (Senna and Mansell are in there), their names don’t – and that includes Ferrari’s. If you’re intent on persisting with it, there’s plenty to do. Single races, time trials, the Championship with its token massively long password that's a necessity for recording progress. 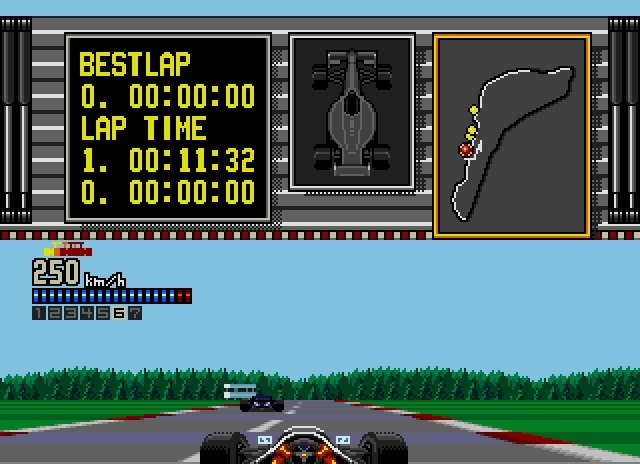 It’s also one of a very select few F1 titles on the system to feature a two-player split-screen option, and though it’s no great shakes, it serves as a minor asset for fans of the sport who want to do battle with mates. By the time FGPC saw the light of day in Europe, it was considerably dated. 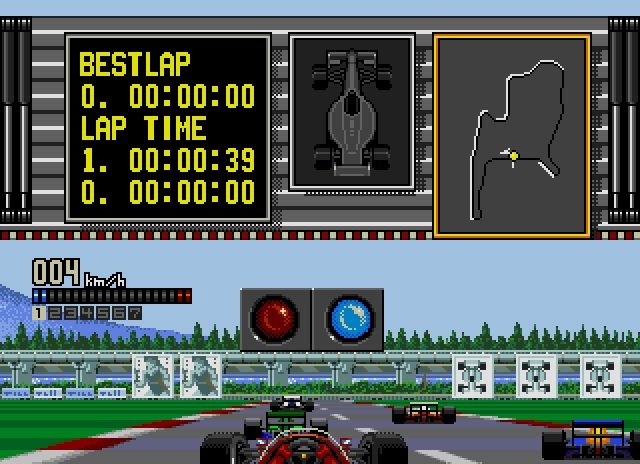 The nature of the beast is that, with several F1 titles of the time featuring more or less the same circuits and layouts, FGPC’s inadequacies are brought into sharper focus. 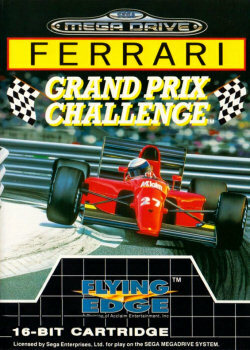 Both SEGA and Domark offered eminently classier alternatives, and whilst Ferrari Grand Prix Challenge may have bagged the biggest name of all, its performance is well short what was needed to compete with those at the front of the Mega Drive pack.